The World Travel Market (WTM) is the leading global travel industry event that features over 100 seminars, 5,000 exhibitors from 184 countries. This 4 day event kept me hopping from morning to late in the evening. At this 35th World Travel Market event, World Travel Leaders celebrated the industry’s achievements consisting of various expert panels debating on how travel will look into the near future with emerging technologies and the ever changing consumer desires as their travel sophistication increases. The National Geographic panel looked at the power of “Going Local” This is an emerging trend that will change how, why and where we travel. It will affect every provider and you should be investigating now how to make “Localism” work for you. At the European Travel Commission Press conference, The ETC represents 36 countries in Europe. RadonicRodgers Strategy+ was part of the consortium that developed the On-Line Digital and Content Marketing and Web presence. RadonicRodgers specifically performed the localized translation services for the French Canadian market on the ETC Website. While in London you must take in all the sites and sounds that London has to offer. Big Ben recently renamed the Elizabeth Tower in honour of the Jubilee, the Tower of London and the Tower & London Bridge and no visit would be complete without a walk to Buckingham Palace. The most spectacular site on this visit was the installation in honour of Remembrance Day Nov. 11th. 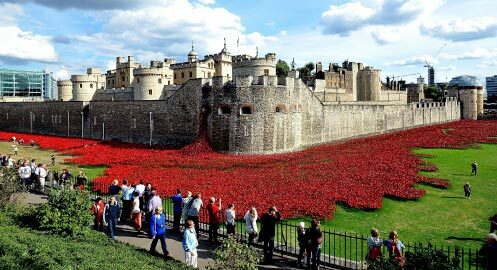 At her Majesty’s Palace & Fortress at Tower Hill near the Thames River, the mote surrounding the fortress was filled with 880,286 poppies, one for every British soldier that lost their life during World War One. The river of red surrounded the fortress, and it was truly a moving and memorable experience. Each night the WTM Festivals and Events provided an opportunity to wind down, network with industry folks after traditional working hours, while enjoying and experience the local culture, hospitality and cuisine. Many exhibitors hosted events at their booths, while others hosted events off site at the local pubs and restaurants. I had the opportunity to attend “TravelMassive’s” event at an underground alternative night club as well as London’s Big Bus Tour & The Hard Rock Café’s event at the first ever Hard Rock Café. The highlight was meeting new friends and reacquainted with old ones. All in all, the World Travel Market in London was a success looking forward to next year.